18. 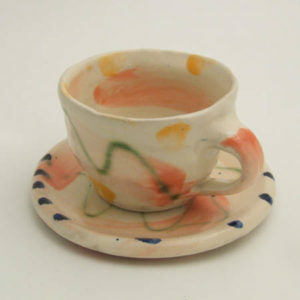 Stoneware teacup, 1993, H. 7.5cm and saucer W. 17cm. Sandy Brown first began to make pottery at Mashiko, one of the traditional pottery centres of Japan (1969-1973). She settled back in Britain and currently works from her studio in Appledore in Devon. She is interested in the expressive and therapeutic potential of clay and is noted for her ‘goddess’ figures, simply modelled and boldly designed in black and white. In a different vein, she also produces a range of thrown tableware in oxidised stoneware decorated with vigorous, colourful brushwork. The artist’s signature is playfully scrawled across the saucer as a part of the decoration.